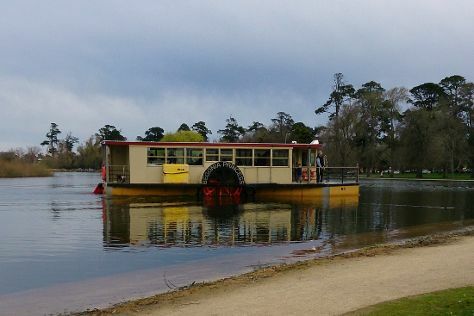 Explore hidden gems such as Lake Wendouree and Eastern Beach Reserve. You'll find plenty of places to visit near Melbourne: St Augustine's Church (in Creswick), Yarra Valley Chocolaterie & Ice Creamery (in Yarra Glen) and Ballarat (Ballarat Botanical Gardens & Ballarat Wildlife Park). Dedicate the 12th (Sat) to wine at some of the top wineries in the area. And it doesn't end there: stroll around Royal Botanic Gardens, examine the collection at Melbourne Museum, admire the masterpieces at National Gallery of Victoria, and take in panoramic vistas at Eureka Skydeck 88. To see maps, more things to do, other places to visit, and tourist information, go to the Melbourne route planning site . If you are flying in from Hungary, the closest major airport is Melbourne International Airport. In October, daily temperatures in Melbourne can reach 24°C, while at night they dip to 9°C. Cap off your sightseeing on the 15th (Tue) early enough to travel back home.